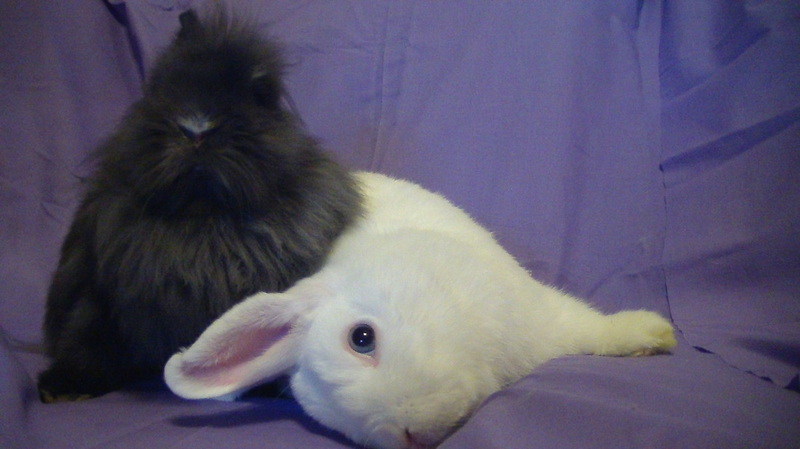 Lily, the black Lionhead, and Corbett, the white dwarf lop, are both close to 18 months old. 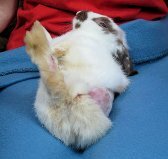 Lily came to us with a broken back and had to have both back legs amputated. Lily needs to have her bladder expressed at least twice a day to prevent a urinary tract infection (UTI). 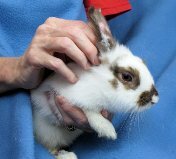 Corbett came to us with head tilt and a severe infection in both ears. He is currently on meds for his head tilt and will continue treatment for three to six months. Corbett requires an ear check and cleaning every six to eight weeks while continuing to control the ear infections. 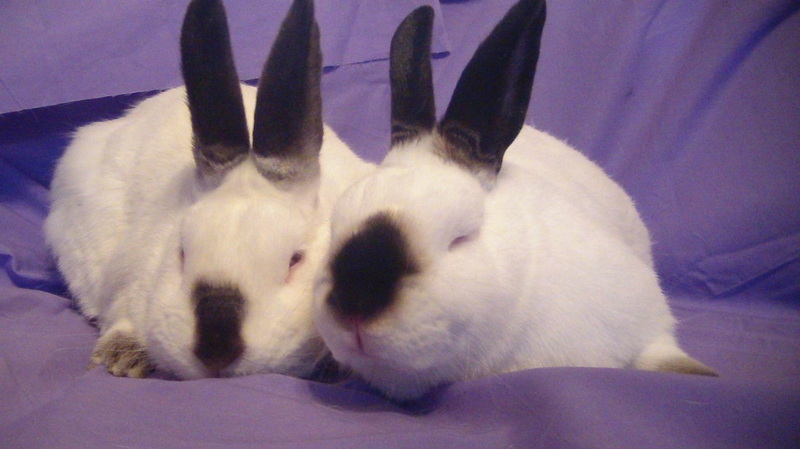 Both require extra padding in their cage and special litter boxes that enable them to get in and out of easily. Lily's original custom made cart was made by Tracie Shelbie who can be reached at tshelbie3@hotmail.com. She is truly gifted with making affordable carts for various companion animals. Lily's cart was made even smaller and more lightweight by NTRS supporters, Randy and Ginger. We thank NTRS Volunteer, Brian Gardner for this GREAT video! Picasso is about four or five years old and was surrendered by his owner. He came in very underweight and in poor overall condition due to dental issues. His teeth grew into his tongue and he already had quite a bit of scarring and thickening of his tongue when we got him. He gets his teeth trimmed every 10 - 12 weeks and receives metacam for a few days after each dental exam. Hopefully, we can bond Picasso and Ireland soon! Ireland is about 2 years old and was found by one of our volunteers injured. She had been attacked by a cat and had lost all the flesh from her back left leg leaving only the bony skeleton. 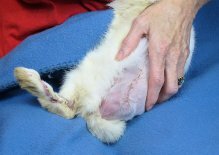 Her back right leg was also, injured and infected from multiple bite wounds. The back left leg was amputated and the back right leg healed nicely after weeks of antibiotics. She requires extra care with cleaning her ears and extra padding for her cage needed by tripods. Marlo, the Californian, and Cosby, the Himalayan, are both close to three years old. Marlo was brought to us injured with blunt force trauma to the face. Her jaw was fractured, her front top teeth completely gone and her lower front teeth broken off. After several months her jaw healed and during that time we removed her lower front teeth. Since then she has had several abscesses from tiny pieces of tooth remaining in the mouth tissue. Each time the pieces were removed, the abscesses cleared up. Marlo requires her food and hay cut up so she can pick it up with her tongue. Cosby was rescued from one of our local animal shelters. He has congenital clouding of the cornea in both eyes. He has suffered from numerous corneal ulcers in both eyes. He has been seeing an excellent animal opthamologist, Dr. Jeff Studer for two years and is rechecked every four to six months. He will be on one or more eye drops for the rest of his life. Donations are very much appreciated to help defray the cost of medical expenses. Use any of the following secure links to contribute.